The lock on the Industrial Canal has been in operations since 1923. 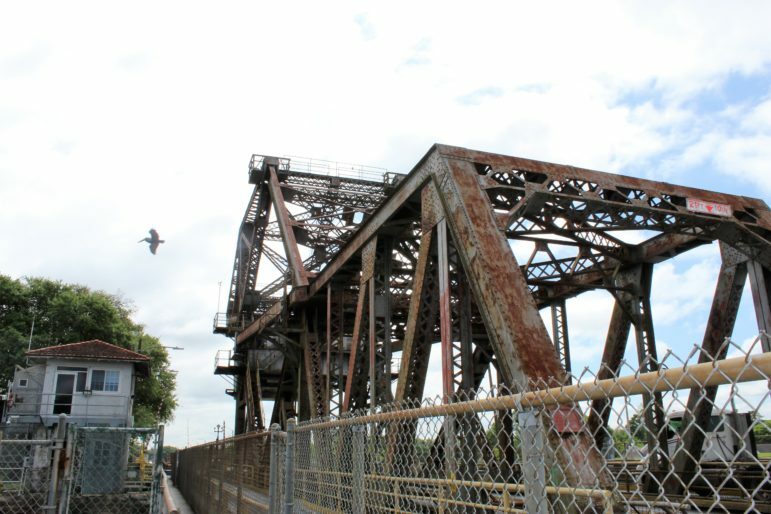 The U.S. Army Corps of Engineers is winding up a three-year study phase of its plan to replace the Industrial Canal Lock, located just north of the St. Claude Avenue Bridge. 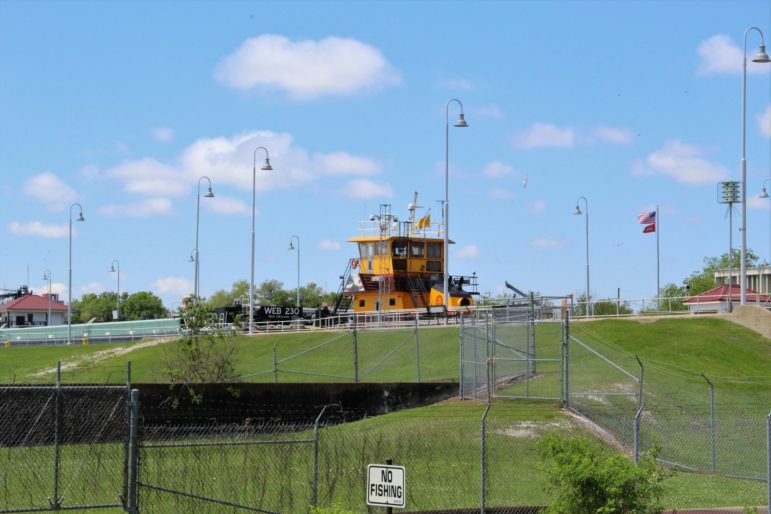 While the study won’t end until December, the Corps already believes its tentative selection for replacing the lock is the best in a narrow range of options for easing inland waterborne traffic. But some New Orleans residents say they’re outraged that the Corps is still considering the project, which has been planned for decades. They’re pushing to have the lock moved out of the Industrial Canal in the heavily-populated 9th Ward and rebuilt somewhere else, citing the huge traffic problems and flood risk such a project could cause in the area. Construction on such a replacement lock could take 13 years — or much longer, opponents warn. And they have little faith in the ability of the Corps to accomplish the replacement without serious community disruption. They also question the value of the project, whose cost is estimated by the Corps at more than $951 million. But the Corps says it is long past time for a new lock on the Industrial Canal, known formally as the Inner Harbor Navigation Canal. The lock and the canal are part of the Gulf Intracoastal Waterway, which winds along the coast from Texas all the way to the East Coast and links to the Mississippi River via the Industrial Canal. Shippers on the GIWW must use a lock because the water levels of the river are higher than sea level in the New Orleans area. The lock in place now was built by the Port of New Orleans in 1923. It’s narrow, just 75 feet wide and 640 feet long. The Corps insists that, while the old lock still works, it’s not at all efficient. Its limited width forces barge traffic to transit one at a time. A barge awaits a tow through the Industrial Canal lock. The Corps says it takes an average of more than 16 hours for each tow vessel to complete the passage, more than 15 hours of which is spent waiting for tows through the lock. And the Corps says the costs of maintaining and operating the lock have increased over the years. 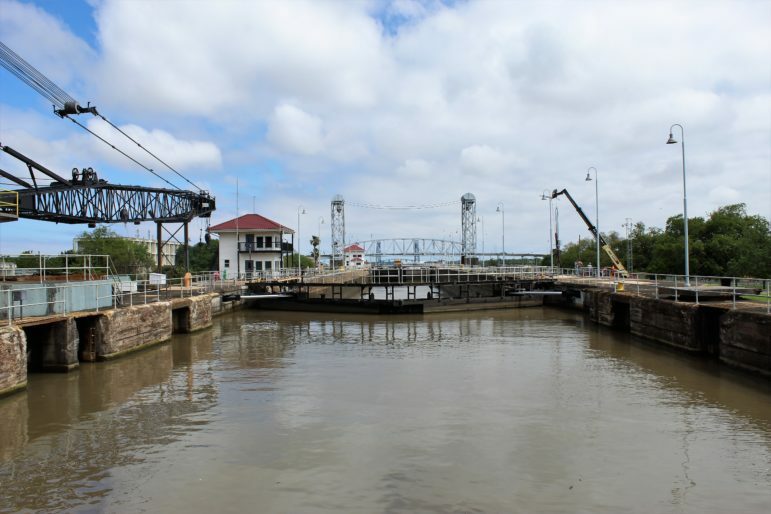 The $951 million cost of the lock replacement would be split two ways, with half paid for by the Corps and half by the Inland Waterways Trust Fund, a U.S. government fund that is paid into by shipping companies that use the nation’s inland waterways. “We strongly support an updated, modernized lock for the GIWW at the IHNC,” Stark told The Lens. 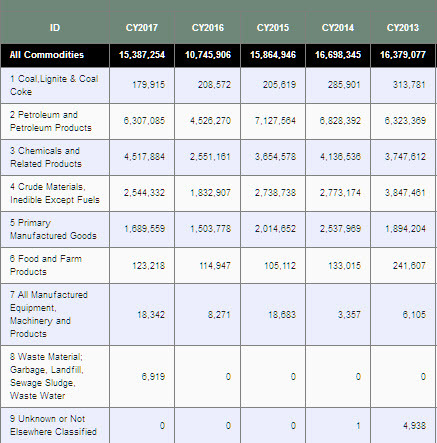 Most recent available data on Industrial Canal cargo totals. The last available report from the Corps’ Institute for Water Resources shows more than 15.3 million tons of cargo were transported up and down the Industrial Canal in 2017. That’s up from 10.7 million the previous year, but totals averaged between 15 and 16 million tons a year from 2013 to 2017. The vast majority of that barge traffic carried petroleum and chemical products. The Canal Association and the Corps say they expect that traffic on the Gulf Intracoastal to increase in coming years. The Corps’ most likely economic growth forecasts suggest annual tonnages on the Industrial Canal could hit the 25 million mark by 2061. 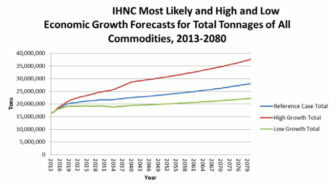 Tonnage forecasts for the Industrial Canal. Despite the industrial desire for a new lock — and its inclusion on a 2017 list of national infrastructure priorities, reportedly compiled by the Trump Administration and obtained by McClatchy Newspapers — there’s currently no funding dedicated to actually constructing it. A barge makes the slow transit through the lock on the Industrial Canal. Initial steps toward construction on a previously planned deep-draft lock were underway in August 2005, when Hurricane Katrina struck the city. But that construction was delayed when a federal court ruling in 2006 required the Corps to complete a Supplemental Environmental Impact Statement (SEIS) to consider the potential impacts of future hurricanes and flooding on such a project. The deep-draft lock project was abandoned after another decision by the U.S. District Court in New Orleans — this one in 2011 — found that the Corps’ 2009 environmental impact statement failed to properly account for the post-Katrina closure of the Mississippi River Gulf Outlet (MRGO) to deep-draft commercial shipping and the impact that would have on shipping traffic. The Corps’ current study phase, which ends this December, is in response to that 2011 ruling and is focused on reanalyzing its earlier research on a lock replacement. The lock that the Corps tentatively recommended in a 2017 draft report would be 900 feet long and 110 feet wide, allowing two barges to transit at a time. It would be 22 feet deep, which is less than the current 31.5 feet depth. It would be built between the Florida Avenue and Claiborne Avenue bridges. An aerial view of the Industrial Canal, locating the old lock and the proposed replacement lock. 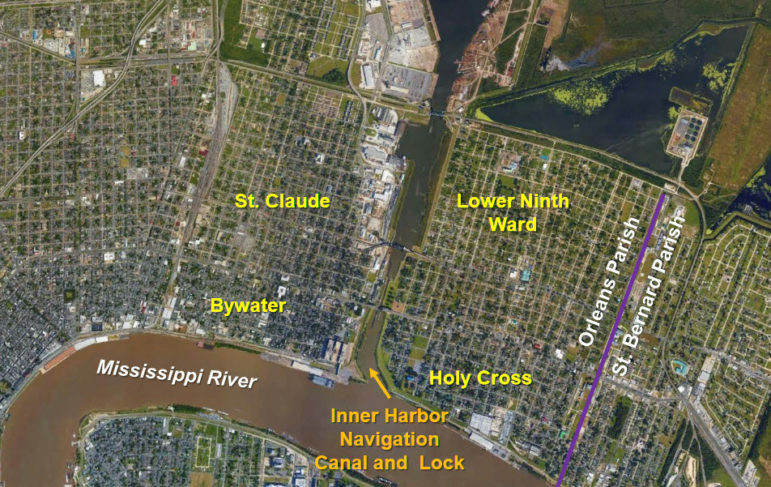 Substantial dredging would be required to widen that stretch of the Industrial Canal, and it would require a huge “cofferdam,” or enclosure, around the construction site, a bypass channel for use by barges during construction, new floodwalls and demolition of the existing St. Claude bridge over the canal. The Corps first would build a temporary bridge at St. Claude during lock construction and later a permanent replacement. 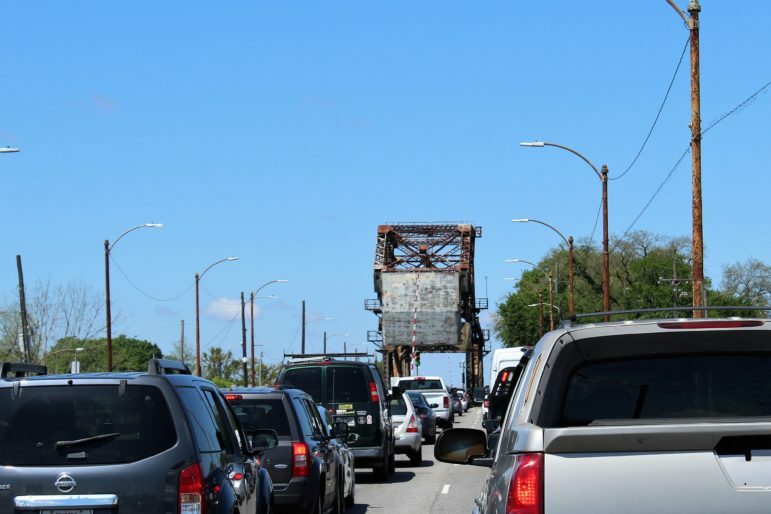 Boyett confirmed that a temporary bridge would replace the St. Claude bridge and also cited possible improvements to the Florida Avenue Bridge to help better handle traffic. “That is one of the focal areas of this entire study, is understanding that traffic and how do you mitigate for it,” he said. The St. Claude Bridge over the Industrial Canal sits adjacent to the lock and is the southernmost of three vehicular bridges linking the east and west banks of the canal. Opponents of the replacement agree that traffic is a huge point of concern. Traffic piles up as the St. Claude Bridge is raised during a barge transit. Residential evacuation ahead of severe tropical weather is a sensitive matter for many New Orleanians. One of the groups involved in discussions with the Corps, the Louisiana Landmark Society, raised the issue in a letter outlining its opposition to the project. Stokes’ letter was written to Jason Emery, the Corps archaeologist who is working with state and local groups in compliance with Section 106 of the National Historic Preservation Act. That law requires all federal agencies such as the Corps to identify and assess the impacts that any project or other undertaking might have on historic properties. The Landmark Society, as well as A Community Voice and the Holy Cross Neighborhood Association, took part in a conference call with Emery Tuesday afternoon. The letter by Stokes addressed a range of issues, including the removal of trees whose “root systems have grown integral to the lock structure” and the impact of noise from the construction vehicles that would continuously transit the area around the lock construction site. Stokes called for the Corps to conduct video documentation of area historic structures, inside and out, to use as a baseline for potential damage compensation to owners. This aerial map labels the four neighborhoods that would be directly impacted by a lock replacement project. Toxic material at the long-polluted Industrial Canal zone is a critical concern. The Corps recognizes a lengthy list of volatile, metal, petroleum hydrocarbon and other contaminants as well as pesticides and herbicides at the site. Corps officials said that much of the material dredged from the canal would not be suitable for open water disposal and would have to be placed in solid waste landfills. Another issue Butler raised was the risk of increased flooding along the canal. Boyett disputed that. “The lock is actually not the plug,” he said. Boyett noted the substantial changes to the system protecting those neighborhoods around the canal from storm surge. He said the system before Hurricane Katrina used the flood walls lining the canal and the Gulf Intracoastal Waterway as first lines of defense. 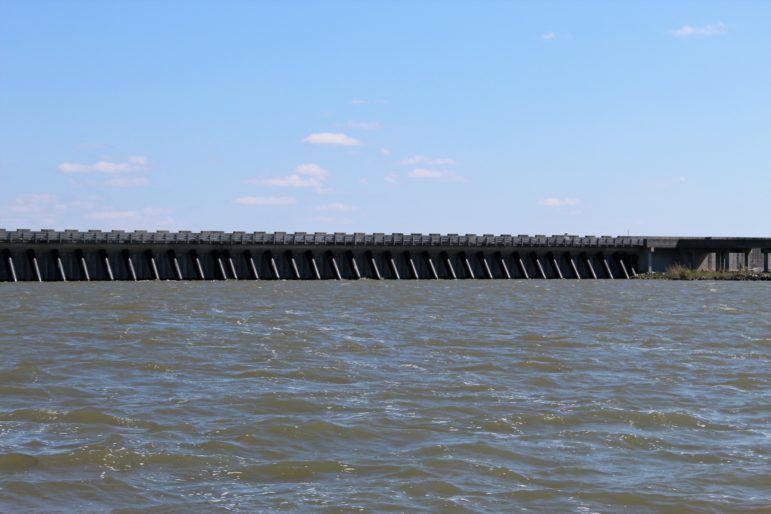 “But the first line of defense now is the surge barrier out in Lake Borgne, as well as Seabrook on Lake Pontchartrain,” he said. A section of surge barrier on Lake Borgne, part of the Corps’ Hurricane & Storm Damage Risk Reduction System. It was completed in 2013. 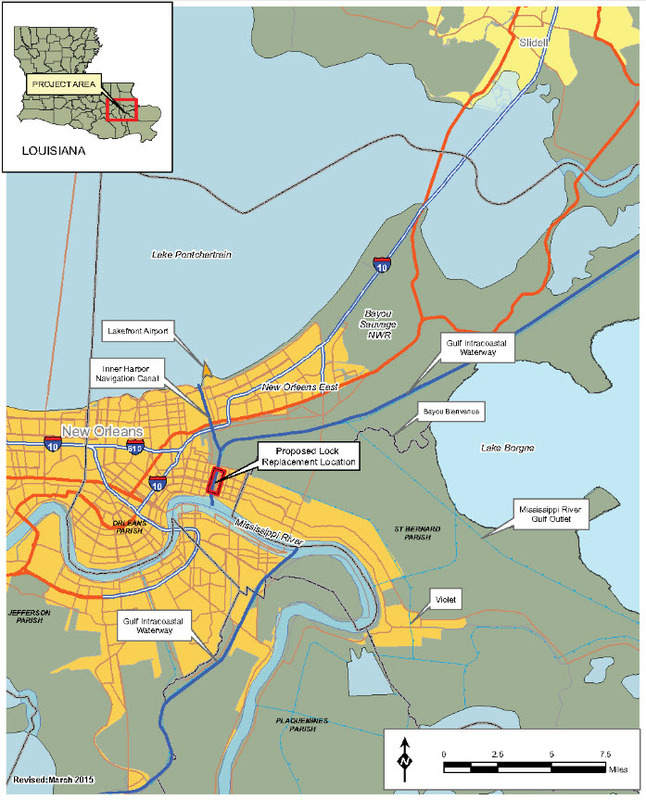 Those new structures, parts of the Corps’ Hurricane & Storm Damage Risk Reduction System around greater New Orleans, were built after dozens of levees failed after Katrina in 2005, including those along the Industrial Canal. The GIWW and the MRGO effectively funneled surge waters into the city, causing severe flooding that left much of New Orleans submerged for weeks. Many residents’ lingering distrust of the Corps is rooted in great part in that disaster and the failures of the old protection system; it is not dispelled by the huge scale of the new protection system, the largest civil works project in the Corps’ history. Boyett told The Lens he understands that skepticism. Part of that planning will go into the Corps’ Community Impact Mitigation Plan, or CIMP. 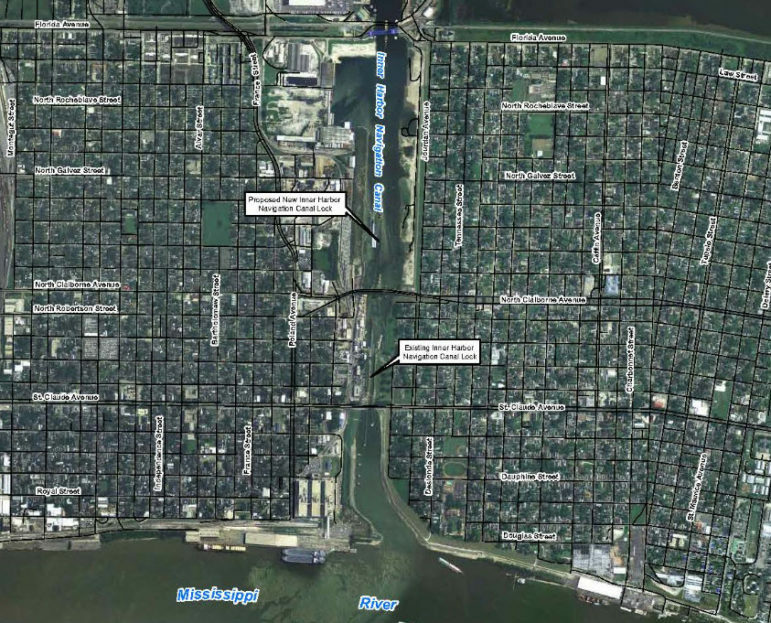 That plan is designed to offset and/or compensate for impacts the lock replacement project would have on the surrounding communities, including the Upper and Lower Ninth Ward, Holy Cross and Bywater. A 1997 draft of the CIMP includes such programs as soundproofing residential structures, synchronizing traffic signals, community-based job training and an incident management plan. But that plan has few details available at this point, and some opponents consider it badly outdated. An area map locating the Gulf Intracoastal Waterway, the Industrial Canal in New Orleans, the now-closed Mississippi River Gulf Outlet and the St. Bernard Parish town of Violet. There’s also a big push by opponents to move the site of a replacement lock completely away from the Industrial Canal. 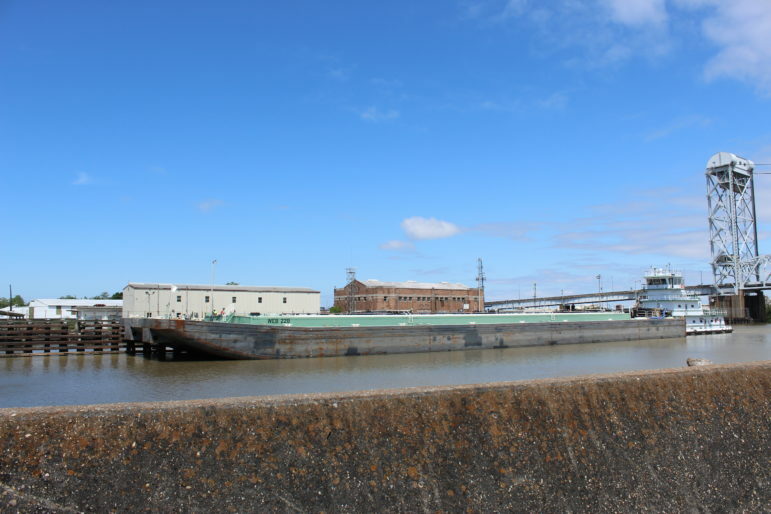 Butler and others at A Community Voice suggest the Corps should build the new lock at the town of Violet, down the river in St. Bernard Parish. Butler said some parish politicians have expressed an openness to discussing a new lock at Violet, whose canal connects to the MRGO. That could pave the way for substantial mitigation funding for the parish. McCloskey has not responded to calls for comment, however, and The Lens has not confirmed any interest by the parish in hosting a new lock at Violet. And Boyett from the Corps said the Violet option isn’t a good option because it could threaten wetlands in the area. “The amount of environmental wetland impact would have been huge for us to go through that way,” he said.